Amid Crisis Abroad And Tension At Home, Trump Cancels Trip To Latin America Press secretary Sarah Sanders said Trump will remain in the U.S. to oversee the American response to Syria and to "monitor developments around the world." President Trump speaks to the media during a Cabinet meeting at the White House on Monday. The White House announced Tuesday that Trump would not be taking a planned trip to Latin America this week. President Trump has canceled his planned trip to Latin America this week. The commander in chief and his advisers are deciding on a response to the Syrian government's alleged chemical weapons attack on its own people. And closer to home, the office of the president's personal lawyer was raided by the FBI on Monday. So Trump is staying put, the White House says. "The president will remain in the United States to oversee the American response to Syria and to monitor developments around the world," White House press secretary Sarah Sanders said in a statement Tuesday. Vice President Pence will make the trip to the Summit of the Americas in Peru instead, Sanders said. News of a suspected chemical attack, said to have killed dozens in Douma, has sparked international outrage. Calling the attack "horrible," Trump has pledged to respond "forcefully." 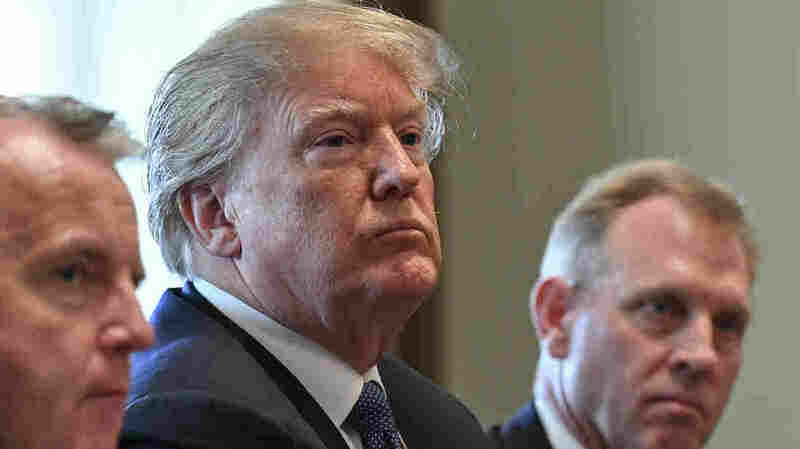 "We can't let atrocities like we all witnessed — and you can see that and it's horrible — we can't let that happen," Trump said at the start of a meeting with senior military leadership on Monday, including his new national security adviser John Bolton. Earlier in the day, Trump held a meeting with members of his Cabinet, where he told reporters that his administration would be making "some major decisions over the next 24 to 48 hours" regarding the response to Syria. "Nothing is off the table," Trump said, when asked about a military response. Trump also spoke to French President Emmanuel Macron in a phone call on Monday. It was the second call between the two leaders since the alleged Syrian attack. Trump and Macron have agreed to coordinate a "strong, joint response." The White House has not released any details about what that response might look like. Following a chemical attack in northern Syria last year, Trump launched airstrikes against Syria. Last week, Trump said the United States was strongly considering taking U.S. troops out of Syria. Sen. John McCain, R-Ariz., said in a statement on Sunday that Trump had emboldened the Syrian government by making it seem the United States was taking its attention away. Sanders pushed back against that assertion during a press briefing on Monday. "The president has made clear that, with the defeat of [the Islamic State terror group], he wanted to be able to bring our troops home," Sanders said. "But at the same time, he wants to make sure that [Syrian President Bashar Assad] is deterred from chemical weapons attacks on innocent civilians, and we think you can have separation." Trump's focus on Tuesday, at least publicly, was not on Syria — it was on the special counsel's investigation into Russian interference in the 2016 election and whether the president's campaign coordinated with the Russians. The FBI seized a number of materials from Trump's longtime lawyer Michael Cohen on Monday, after prosecutors in New York received a referral from special counsel Robert Mueller's team, Cohen's attorney said. Early Tuesday morning, Trump tweeted that "attorney-client privilege is dead!" Although the privilege shields much of what takes place between a lawyer and a client, it does not provide a defense against criminal activity or fraud. A special team of Justice Department officials is now expected to begin working through the materials seized by the FBI from Cohen to determine what still is covered by attorney-client privilege and what, if there were some evidence of wrongdoing, could eventually be submitted as evidence in court. Separately on Tuesday the president's new national security adviser, John Bolton, appeared to be making personnel changes as he remakes the staff following his arrival on Monday. To that end, the White House announced the departure of homeland security adviser Tom Bossert.